The sun rose in PC-03, located in a cosy forest, relatively sheltered from the wind. Last night the media team of four uploaded our images and stories in the cafe of the Amerindia Hostel in Puerto Natales. The owner, Paula, very graciously allowed us stay way past closing and even called their internet service provider to re-boot their system when our wifi wasn’t working quickly for the heavy files that needed uploading. Such kindness is an example of the behind the scenes aspect of the “pull of PER”. 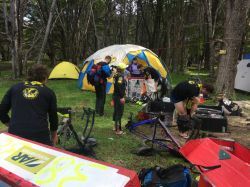 We arrived at PC-03 at 03:56 to await the lead teams, Bend Racing, Columbia Vidaraid and East Wind. Patagonia is so wild, so remote, that it strips anyone who enters of any artifice; like ripping pages out of a book, crumpling them and throwing them to the wind. Ego, gone. Arrogance, gone. I saw a comment on Facebook that the race had “taken some big scalps”, in reference to the athletic resumes of the plethora of racers who haven’t been able to reach the finish line; a very astute summary of the race history. It takes a special kind of person to complete this race and that is in no way a value judgement. This third day of racing is showing yet again the difficulty of racing the Last Wild Race. Dot watchers will have been holding their breath, watching the progression of the last two teams as they attempted to finish the first trekking section while the lead teams are already nearing the end of the third section. The distance over which the race is now spread geographically, we call it the “live” course zone, is like Patagonia itself - vast. At 08:56 at PC-03 the RD informed me that Spirit of Poland had contacted the race HQ and asked for a helicopter extraction off the first trekking section. Apparently Marta had a shoulder issue that made it impossible for them to continue. They explained that the race helicopter was only for absolute emergencies and after looking at the team’s private insurance policy, a helicopter was dispatched using their insurance. Two members of the team helicoptered out and the other two walked off the mountain. The RD confirmed that the Polish team had arrived safely to Puerto Natales. The US team Extreme Operations also appears to be out of the race; the tracking shows them to be heading down off the mountain, using a line that will take them to Estancia Perales where the organization can extract them. At the time of this writing they had yet to call the organization so this information is based on my conversation with the RD. There is currently an intense battle on for first place and Bend racing arrived first at PC-03, at 11:50. Jason spoke of a very special moment they had had on the section. He and his wife Chelsey had lost one of their twin sons at birth and a large part of their racing this year is to connect with his spirit. Jason spoke in transition of seeing a huge rainbow that accompanied them as they were talking about it being Thanksgiving in the US. It was their spirit son saying hello, Jason said. Lars came in pumped and said that it was a fun trek and would be great to get dry after being wet for so long. Alex replied that he was glad that they’d purchased the flip flops in Punta Arenas prior to the race start; his are bright pink. Getting out of their wet clothing and lubing up, humans and bikes, they talked to each other through their preparations for the next stage. Alex found a pack of pickles in his food bag and fed each team member bites. Chelsey asked the volunteers to turn down the pumping music as she couldn’t think clearly with the outside distraction after so much time in the wild. Such is communication at this level of racing, blunt and to the point. Anyone not involved in AR would perhaps wonder if these people even liked each other but to those of us who follow the sport it makes perfect sense; they are like different limbs on the same body, pushing forward to a common goal. Hmm, it just dawned on me, could adventure racing be a cult? Barbara Bomfim added that the section in the turba had been difficult because of the uneven terrain but that the views had been spectacular. A majestic condor flew over head as they were finishing the transition from the second trek to their mountain bikes. Team East Wind are in third place and yet to arrive at PC-03, but are not far behind (relatively), then there is a large gap to the following teams who will be trekking through the night once again.